I'm gave this talk on July 1, 2016 in Klaipėda at the conference Kultūrų dialogas: šiuolaikinis tomizmas ir postmoderni visuomenė. My lifelong quest is to know everything and apply that knowledge usefully. I want to share the progress that I have made this last year to imagine everything from God's point of view. I will describe it as God's dance, a system of 24 ways by which God is known to our imagination. I will draw on my own personal experience of God and also on my explorations of the limits of my imagination. I will start by asking us to imagine God's point of view. My talk relates to Thomas Aquinas simply in that I will provide a new way of thinking about the Holy Trinity. Thomas Aquinas, much like other Fathers of the Catholic Church, asserted that the Holy Trinity is a mystery, and we must rely on faith and Scripture in order to make sense of it. Yet that is to say that non-Christians cannot comprehend the Holy Trinity, which happens to be the organizing principle for the Creeds, and thus for Catholic dogma. Instead, I will explain the Holy Trinity not as a mystery, but as a construct of our imagination, a key part of God's dance, which can make sense to all people who imagine God's point of view in all manner of ways. I am curious if it will make sense to you. I invite you to have an open mind. Maybe God is good or bad, maybe God exists or not. As a six-year old child, I knew that I would need to ponder such questions, for I had resolved to know everything and apply that knowledge usefully. But such questions might be very dangerous. And so I offered God a covenant: give me the freedom to think whatever I need to think, and on my part, I will always believe in you, regardless of what I come to know. And now, after all of these years, I dare to say that these are the same questions which God himself ponders: Maybe God is good or bad, maybe God exists or not. Let us please imagine how God ponders such questions. Jesus did not speak about the Holy Trinity, but rather, he showed the relevance of God's point of view. I will start with an example of how Jesus appeals to our personal experience, including the questions by which we figure things out. Let me please ask you, what did Jesus say distinguished his followers from all other people? Love your enemy... "If you love those who love you, what reward will you get? Are not even the tax collectors doing that? And if you greet only your own people, what are you doing more than others? Do not even pagans do that?" Jesus does not teach abstractly about the Holy Trinity, but rather, he teaches what it means to be a child of God, to do as God does, to be unconditional even though we are conditional: "...love your enemies and pray for those who persecute you, that you may be children of your Father in heaven. He causes his sun to rise on the evil and the good, and sends rain on the righteous and the unrighteous. ... Be perfect, therefore, as your heavenly Father is perfect." Love your enemy. This requires that we split our mind so that we can both hate an enemy from our own point of view and love them from God's point of view. An atheist can be good but she cannot split her mind. Consequently, she may not allow herself to have any enemies. Whereas one who imagines God can be sensitive to the reasons for hating someone and yet be responsive with the duty to love someone. Imagining how things might look to God is like using negative numbers in mathematics. They open up entirely different possibilities. For example, we can serve as God's antenna in this world by which God investigates who to love and how and why. I will discuss what and how and why God investigates, and then I will show that the Holy Trinity is the form for God's most basic investigation. But the Holy Trinity provides only God the Father's point of view, God as I, where God takes a stand and loves himself so that God is united. I will then add God the Son's point of view, God as You, where God follows through and loves each other, so that a person is united, and God the Spirit's point of view, God as He, where God reflects and loves all and so all people are united. Finally, I will discuss our own human point of view where we investigate by taking a stand, following through, and reflecting, so that God lives and investigates directly through us, and the unity of God, the unity of a person, and the unity of people are, in practice, all the same unity. Arithmetically, God the Father's investigation involves three points of view, God the Son's version is like his prayer "Our Father" and involves eight points of view, God the Spirit's version is like the Ten Commandments and involves ten points of view, and our own scientific method, the three-cycle of taking a stand, following through, and reflecting, consists of three points of view by which God investigates along with us. Together God's dance brings together twenty-four points of view, which is to say, twenty-four ways by which God manifests himself in our imagination as I or You or He or directly through our very own lives. What does God investigate? Imagine God who is prior to all things, prior to existence, time, space, love, meaning. Then there are many questions which do not move him. He can exist or not, it means nothing to him, for existence and nonexistence are just words or concepts which get their meaning from him. In any event, all things are true for such a God. I can imagine only one question that moves him. God asks himself, is God necessary? Would God exist even if God does not exist? How does God investigate? We can imagine that what God thinks is what God does and what is. In other words, such a God is a headstrong God, there is no deliberation or contemplation, for whatever God thinks already is. Would God exist even if God did not exist? This proceeds on two tracks as if in a proof by contradiction. If God exists, then God exists. This is the spiritual world where God is assured. And if God does not exist, then yet God exists even so. We recognize this as the physical world, which is evidently by nature atheistic, and yet we hope that God will manifest himself, and indeed, quite a few of us believe that God has manifested himself, for example, as Jesus of Nazareth. We can thus imagine the human condition, and likewise Jesus's condition, as the least favorable circumstance in which God might possibly come to exist, and therefore a most interesting circumstance for God and his investigation, is God necessary? God thus moves aside that he may not be. How can God remove himself? God must go beyond himself. But first he must have a self. Indeed, God's self arises as God goes beyond himself, and where is he to go? Into himself, and so God goes beyond himself into himself. His self is Everything, for God thinks and knows and wills everything. Everything is the structure of God, and God is the spirit of Everything. And so Everything arises when God explores, would he be even if he was not? Clearly, God must be, for otherwise he would not be God, and yet again, all things are true of God, but it is the process which is informative, how and why the truth unfolds. Why does God investigate? The purpose of God's investigation is eternal life. What does that mean? Life is the fact that God is good, but eternal life is understanding that God does not have to be good, life does not have to be fair. This is a shocking idea, and I think it is what Jesus meant when he told his disciples, "I have much more to tell you but you cannot bear it now. But when the Spirit of Truth comes, he will tell you all things." Morally, our lives are God's investigation: are we simply living or are we living forever, growing forever, learning forever, here and now? God is unconditional. But is his investigation unconditional? Is there within us an endless striving to uncover God? This striving is love, and it is the essence of God and his unconditionality, this insistence that there must be the unconditional, even if it is not good. For what is good? It is the conditional unconditional. God creates the conditional, a system, and arises in it as the good. The structure of good is slack, and the spirit of slack is good. Life is wherever God and good come together, as for example, when a tree has slack inside of it which is supported by everything. But eternal life is understanding that God is more than good, that we live in an ambiguity, that aside from the justice of a closed system, where everything must fall apart because of entropy, there is also the grace of an open system, where our lives are fostered by an endless love, as the sun loves the earth. If we insist that God is good, then we cannot grow. But if we are open to see the injustice of the world, if we realize that so often it is too early to say whether God is good, then we find that we ourselves must be good, that in this world, we ourselves must be the source of unconditionality. We ourselves must live as God, just as Jesus does. Our own will is to love the perfect, but eternal life is that we instead choose and live God's will, which is to love the imperfect. 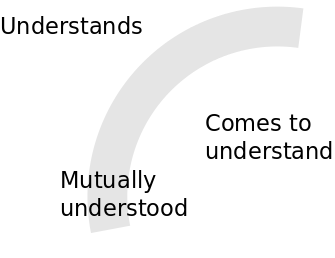 I explain this in order to clarify what it means to understand: Understanding is separating, in this case, what is good, within a system, and what is God, beyond a system. Would God exist even if he did not exist? God separates his existence and nonexistence and thereby understands. God removes himself but surely arises. Thus we have God who understands and God who comes to understand. How do they know they are the same God? Because they understand the same God. And so we have a way to talk about the Holy Trinity which does not require faith but simply an honest look at our imagination. We have God the Father who understands, God the Son who comes to understand, and God the Spirit who is understood by both. This is strange but straightforward. However, it is only from God the Father's point of view. Let us now consider the same investigation from the point of view of God the Son, who arises where there is no God. Indeed, we can consider our own point of view. Sometimes I ask myself, am I God? I seem limited, and yet are there possibly circumstances by which I may truly be God? And so I can imagine Jesus of Nazareth as one who likewise did not know if he was God or not, but he figured it out. I know God by considering the limits of my imagination, as I am doing with you. I am naive, but if God is not cruel, then my imagination, which God endowed me with, tells me how things truly are and God truly is. And if God is cruel, then I am greater than God. Instead, there is a sense in which we are equal, at least at those times when I am open to God, when I am looking for him or not avoiding him. My limited imagination of God is a mirror which perfectly balances God's kindness and my own naivety so that they reflect each other in that mirror, they transcend that mirror, and in that sense, they are both transcendental. God and I are one as a mother and a baby. God the Son is my own naivety, as a person without experience, like a fool or a child, as a person in general, who would do what any good person would do. God the Spirit is that perfect mirror which is my own childlike imagination of God. How do I look for God? I should be like the lost child who is smart enough to realize that I am the child and God is the parent. I am conditional but God is unconditional. Therefore I should not look for God, but God should look for me. I should go where God will find me. We can recall Jesus, the lost twelve year old, who told his parents, Did you not know that I had to be in my Father's house? We can thus expect for God to find us when we are open to him in prayer. Here God is You, not only for us, but for Jesus as well, God is You. Our goal is not to share being with God, as when God is I. Rather our goal here is a shared perspective, as when the lost child and his mother know where he must be, for they share the child's view of the parent's view of the child's view of the parent's view of the child's view. The perspective is that by which the view beyond the system matches the view within a system, and vice versa, so that our view matches God's view beyond our imagination's mirror. Jesus gave us such a prayer which has us pray "Our Father" to the one who loves us more than we love ourselves, who wants us to be alive, sensitive and responsive, more than we ourselves wish to - for we ourselves find our existing life too much and we try to escape it and diminish it - but God wishes us to grow and learn and live forever, here and now - and God like a mother or father takes more seriously than we ourselves the nonsense that we care about. Do we have contact with such a God or not? When I do have contact with God, then I would rather have God think than I think, God be than I be, and God do than I do. When we do have contact with God, then God is deep within us, as when his name is glorified in us, or when his kingdom reigns in us, so that what we each believe is what happens, and when our good will opens the way for his good heart within us. But when I do not have contact with God, then I ask God beyond this world to watch over me, so that I may check myself. Give us our daily bread so that we may follow through on the stands we take. Forgive us our sins so that we can look at what we are doing. Lead us not into temptations so that we can choose our stand from what we are thinking. And deliver us from evil, You do not need to be a perfect God, but simply a sufficient God, good enough. If we read the Gospel from Jesus's point of view, then we can appreciate Jesus's disagreement with God the Father. Jesus was a good child who was ever seeking God. He believed that if all of the good children came together, then we could organize a kingdom of heaven where God would surely be among us on earth, and our example of how good we are would inspire all to come together, as he describes in his Sermon on the Mount. But God the Father gave priority to the bad child, that side of each of us which hates the good child for being good. The Son of God is an example to all, for he does as God does, but Man makes an example of the Son of Man, for all to learn the price of being good. God thus lifted Jesus up on the cross so that we could see how wicked we are and would repent. But this was not Jesus's wish, as he said at Gethsemane. God so loved the world that he gave his only begotten Son. Whereas Jesus said, I do not pray for the world, but I pray for my own. Yet Jesus submitted to his Father's point of view even so. And now forever we shall experience Jesus's own vision unfolding, where the good news is not the cross by which Jesus is dead, but the good news is the kingdom of heaven by which Jesus is alive and did not have to die. God goes beyond himself and discovers himself in this world as I, as each of us. God and I meet in You. You are where I see God. But I should not look at God for that is simply life which leads to death, this insistence that God is good. Instead, I should look with God and investigate with him all of the possibilities where God needs to arise. And so we can imagine that the good child is waiting for God to come from behind and join him here in this world and thereby share the same perspective. The good child imagines God as the one who knows and rules everything; as one who we can collaborate with; as one who can be partly cruel; as one who can be available as knowledge of all things in a culture of the skeptical, that is, the poor-in-spirit. The bad child is not looking for God but rather is taught by life to step backwards towards God, first by noting all manner of grace in this world; then as the one who assures as we learn so that we can let go of our old self and take up our new self; next, as the perfect person who we may struggle to be; and finally, as the God we may honestly glorify as providing for us in ways that surpass our belief. All of us, including Jesus, know both sides of this mirror, by which God is within us, the good children, and God is beyond us, the bad children. We thus see how God's investigation proceeds from Jesus's point of view. We like Jesus find ourselves in this world. We look for God within it, we look for absolute goodness. But God is not within this world and so God is either beyond this world or God is deeper within ourselves than we are able to look. Our dissatisfaction with this world is the same as God's dissatisfaction with his own initial unconditionality. And our shared dissatisfaction is our shared perspective with God, our shared Spirit which establishes that God truly arises in this world within us, deeper than we are able to look. Let us now consider how God's investigation proceeds from God the Spirit's point of view. From God the Father's point of view it was obvious that God as I must arise for God loves himself. From God the Son's point of view it was more problematic that God as You must arise in this world and yet indeed God loves each other. From God the Spirit's point of view we have the eternal investigation of whether God as Other will arise in each of our lives, whether God loves all. We thus imagine a gap between God beyond this world and I within this world, a gap where there is an Other. The idea is that from the Spirit's point of view, God and I are one in our conditions, our circumstances, our non-being. God loves all at once, unconditionally, by creating all of our circumstances, by going beyond himself into himself. We imagine the primordial God which wishes for nothing, is self-sufficient, whereas we have needs; the divine attention which wishes for something, is certain, whereas we have doubts; the God who lurks in ambiguity, who wishes for anything, is calm, whereas we have expectations; the good heart which we hope to testify does exist in the depths of each of us, who wishes for everything, is loving, universally, indefinitely, whereas we are defined by our own particular deepest values. The factual circumstances by which God thus goes beyond himself are testified as echoes by the four commandments we keep to respect God's universality, as when we allow no need for other gods, no uncertainty in God's name, no work to disturb God's peace, no reason to dismiss God's symbol, our parents who love us more than we love ourselves. We thus embrace God's circumstances as our circumstances, our world which he goes beyond himself to create. But does God embrace our circumstances as his own? God loves all unconditionally, but we love conditionally, for we can only love others if we thereby love ourselves. In God, we can split our minds and love our enemies, but of our own, we can only love our friends, those who love us, who we may love as we love ourselves. And yet our circumstances are split, for there is a gap between God and us, between how God can love others and how we can love them. And in that gap, in our conditionality, our respect for our individuality echoes forth to God as commandments for God to establish the kingdom of heaven in ways that respect our individuality, our own deepest values, our self-determination, all that we find meaningful in this world, our bodies, our families, our communities, our nations. For in the kingdom of heaven, the truth is local, as near and available to us as we ever wish it to be. By not killing each other, we command God to love our lives and our bodies, just as he loves himself, that we may love ourselves, likewise. By not stealing and not adultering, we command God to love our relationships, our ability to step out and create a loving home and likewise to step into a union of intimacy, just as the Father and the Son love each other. By not lying, not coveting things nor people, we command God to love our worlds, to respect our dreams that we pull together with our truths, our belongings and our attachments, so that they all make sense in the kingdom of heaven by which God loves all. It is not our bad behavior, but rather, our good behavior, our respect for each other, the God within us which constrains and challenges God beyond us to respect our individuality, which legislates commandments for him to keep. We thus understand Him as a God who we can know from what he is not; who reveals Himself as greater than us when we are inspired to hold him our equal; who gives us freedom by which we reveal ourselves; who is intent to reach each and every one of us; who gives us people who we are inspired to love with all of our body, mind, heart and will; who is all alone alongside us when we feel all alone. We are thus by our own goodness able to have a God who is good, even though God doesn't have to be good. Just as our naivety provokes God's kindness, so our devotion to each other provokes God's reign through the kingdom of heaven, which establishes eternal life in this world, here and now, as the center which reaches and bridges all realms, which unites all people, so that we may wait forever for a heaven, but we will never let anyone go to hell. From God the Spirit's point of view, God is arising in this world as this kingdom of heaven which is given by our shared circumstances. God's investigation has him go beyond himself into himself, and thus create a world where he can arise as a universal love, where we have needs, doubts, expectations and values by which we may love and be loved, and by which we may keep commandments that respect his world and embrace it as our own, as the kingdom of heaven, of eternal life, here and now. Likewise, our investigation is to go beyond ourselves into each other, and thus by our love for all to define for God our world, that kingdom of heaven, so that it is our shared circumstance, our shared non-being in which we are utterly free to be, all of us in harmony, where all our dreams are real. And yet we are not our circumstances, but something ever more. Our circumstances which we share with God show that indeed we are God. We have thus three perspectives by the three persons in God's investigation: The Father, the Son, and the Spirit. But the reality of his investigation depends completely on the unity in each of us by which we conduct our own life as an investigation, by which we ever take a stand, follow through and reflect. For this is how we grow forever, here and now, so that God's love is frutiful, God's will is fulfilled, and God exists. When we reflect, we obey the commandment to love, we manifest the unity of all persons in the extension of God's creation with our own dreams in the kingdom of heaven. When we take a stand, we believe that we will come to understand, even as God understands, and so we manifest the unity of God. And when we follow through, we unite our own person so that we look after the bad child within us but keep alive the vision of the good child within us as well. All unity is real for we live our dreams and so God ever arises, unfolds, grows and truly exists. This is my sketch of God's dance. I thus suggest that we take as a basis for dialogue the various ways that we imagine God's point of view.